It'll be updated when possible, relax. The update was like 10 minutes ago, out of the blue. Its not aslains problem, its wargaming bringing an update out during the day, idiots they are real idiots, I had to uninstall the game and re install. Is there a way to re install the client without having to download everything again? I installed WoT only a few days ago on a new PC, and the C:\Games\World_of_Tanks_EU\updates\wot_1.4.0.1133_eu map still contains a couple of 4 GB wot_1.4.0.19393_*.wgpkg. * files. 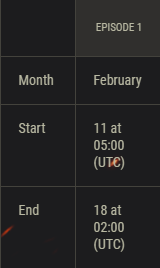 Frontline is only from 3PM PST to midnight, right? I am confused why this is a problem? Frontline is all day, every day, for the week that it's active every month. It starts on 11th, at 3 PT, and ends on the 18th, at 00 PT? It started on EU today. And started at 6 AM.. and hasn't closed... so it'll be running non-stop. IC ... LMAO! It makes sense explained. The NA schedule is badly worded compared to EU's, hehe. Never mind, found out the game can still be played in Safe Mode. If there is a problem with the client you don't need to uninstall. Just go to "Game Settings" and select "check and repair". This will perform a scan of the game and correct any faults without the need to uninstall.